The Island of Sri Lanka lies 3 degrees north of the equator, 82 degrees east of Greenwich and 32 KM southeast of India. She occupies 65,610 sq Km (approximately 25,000 sq miles). She possesses tropical beaches, ancient monuments, rain forests, gorgeous waterfalls and many places to delight any person. The typically tropical climate with an average temperature of 270C fluctuates between 150 C in the highlands to 350C in certain areas of the lowlands. Sri Lanka is mainly an agricultural country. She is self sufficient in her staple diet rice which is the largest cultivation. Tea, Coconut and Rubber are the main economic agricultural crops. Tea brings beauty as well as the foreign exchange to the country. 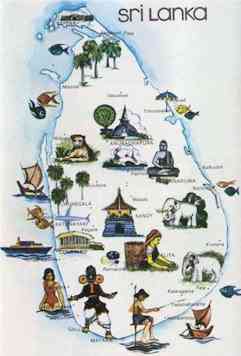 Sri Lanka, according to historical sources was settled by Indo-Aryans in the 6th century B.C. 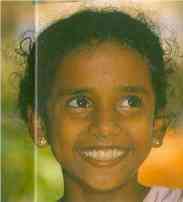 These Indo-Aryans were the first Sinhalese, who are 74% of the population today. The Indo-Aryans assimilated the indigenous inhabitants who are called Yakkhas in the historical chronicles. While the country had contacts in historical times with various foreign races, the Tamil and Muslim minorities of the present day had no settlements in the island until about the 10th century AD; that is to say about 1,500 years after the Sinhalese settlement. From the 19th Century however, Tamil minority leaders have put forward various claims to political rights unsupported by fact or principle. From the early 1970s the Tamil political leadership has sought to enforce even more extreme claims with the use of violence. From 1949 the Tamils have been claiming the right to establish a Tamil state in over one third of the island. A Muslim theocratic party, the only such in a non-Muslim country, was formed in 1985 with the objective of establishing a Muslim political region in the island. The Indian Tamils, the first of whom were brought in the 19th century as labour by the British, were a floating population until the end of the Second World War. Though they were all entitled to Indian citizenship under Article 8 of the Indian constitution, they have been indiscriminately granted Sri Lankan citizenship by various Governments of independent Sri Lanka. The Indian Tamil leaders now expect to establish an Indian Tamil autonomous region in the heart of the country. Minority politics particularly Tamil terrorism seek to wreck the political, financial and cultural life of the country and there is serious disruption already. Sri Lankan ethnically fall into four main categories. They are viz Sinhala, Tamil, Muslim and Burger. The population of the Sri Lanka was estimated to be 17.6 million in year 1994. The largest ethnic group is Sinhala being 74% of the Population. The Sinhala People, whose language belongs to the Indo-Aryan family, is the oldest living Indo-Aryan language. Evolution of this language can be followed by studying the inscriptions and literature from the third century BC. Arrival of Sinhala people to Sri Lanka on 6th BC was archeologically proven when excavation in the Anuradhapura citadel came across a vessel of ceramic which was inscripted in Brahmi script. The script "BIYA ANURADHA" which was the name of one of the ministers of the King Vijaya the leader of the people who came to Sri Lankan. Historical chronicles of Sri Lanka called Mahavansa and Deepawansa corroborating with those archaeological evidence which was tested by radio carbon and photoluminescence methods. Immigration from South India was witnessed much later time and they were also desolated to the dry zone by Portuguese and Dutch who later captured the coastal areas of Sri Lanka. Buddhism was introduced to the isle in the 3rd century BC by Buddhist mission set by the India great emperor Asoka. Almost the entire population observed Buddhism and it became the national religion. Today 63% of the population and Buddhists almost all o them are Sinhala. 15.5% of population are Hindus and most of them are Tamil. As a religion, Muslim represent 7.6% of the population, while 6.8% of the population being the Roman Catholics. Sri Lankans are well known for hospitality in all over the world. They are always smiling and friendly. They are very tribe base hence they love their mother land and their language very much. The Island of Sri Lanka or Ceylon, as it was known till 1972, is situated off the south eastern tip of the Indian subcontinent between the longitudes 80 and 82 degrees east and the latitudes 6 and 10 degrees north. Its maximum length is 432 kilometers from north to south and its maximum width is 224 kilometers from east to west; it has an area of 65,525 square kilometers. Its exclusive maritime economic zone extends over an area of 517,400 square kilometers of Indian Ocean rich in living and non living resources. She possesses tropical beaches, ancient monuments, rain forests, gorgeous waterfalls and many places to delight any person. The typically tropical climate with an average temperature of 270C fluctuates between 150 C in the highlands to 350C in certain areas of the lowlands. Its relief is characterized by a south central hill country and by lowlands stretching away from the hills to the coasts right round the island. There are 14 peaks rising more than 2000 meters above mean sea level the most famous of which is Sri Pada or Sacred Foot Print (of Gautama Buddha); westerners call it Adam’s Peak. The island is visited by the south west monsoon from May to September and the north east monsoon from December to February while there are two inter-monsoon periods in March-April and October-December. The land is drained by a number of rivers of which 16 are more than 100 metres long, the longest being the Mahaweli Ganga (335 kilometers). The monsoons and the relief create a rainfall pattern which divides the island into three agro-ecological zones viz. The wet zone, the dry zone and the intermediate zone. The south west quadrant of the island approximates to the wet zone where agriculture is possible throughout year on rainfall alone but this zone is not as suitable as the dry zone, if irrigation is provided, for the cultivation of rice, the staple food of the people. Most of Badulla District, the northern half of Moneragala District and the easternmost areas of Kandy and Nuwara Eliya are in the intermediate zone as are substantial areas in the south of Puttalama, Kurunegala and Matale Districts. The rest of the country, other than the peninsula of Jaffnapatnam in the north, is the dry zone proper with a period of severe drought from May to September and where (surface) irrigation is needed for agriculture on a sustained basis; Jaffnapatnam is an exception in that it is underlain by miocene limestone with aquifers which store rainfall (and therefore not part of the dry zone) that give the Peninsula an abundance of ground water supporting intensive farming and a dense population. All the above factors have determined human settlement and land use in the island during the whole course of its recorded history. This commences with an account of an Indo-Aryan immigration from North India in the sixth century B.C., who in the course of time assimilated pre-historic tribes known as Yakkhas, the remnants of whom are known now as Veddas. The Sinhalese exploited climate and topography to develop an irrigation system of a magnitude and complexity never known in any part of the Indian sub-continent. The account in the Mahavamsa, the principal historical chronicle of the Sinhalese, of this Indo-Aryan immigration and occupation thereafter is corroborated by the discovery at Anuradhapura of Prakrit writing in the Brahmi script which has been reliably dated to a period between 600 and 500 B.C. These immigrants were the first Sinhalese; they gave the island its first historically known government and its historically best known name Sinhaladipa or "the Island of the Sinhalese". All the Sinhalese were converted to Theravada Buddhism in the years after its formal introduction in the 3rd century B.C. Even today, the Sinhalese are 74% of the total population (1993 estimate :17.6 million) while 69.3% of the total are Buddhist by religion despite nearly 5 centuries of conversion and proselytising. High quality crucible steel was made by the Sinhalese in mediaeval times. Steel from Sri Lanka was used to make the blade of the famous Damascus sword of the Arabs. There is very little exploitation of iron ore now though there are reserves of over 2.2 million tons. The well known mineral sands deposits north of Trincomalee bear reserves of 4 million tons with 70% ilmenite. There are also recently discovered reserves of 3 million tons of ilmenite, 6 million tons of rutile and 4 million tons of zircon in another belt north of Trincomalee. Sri Lanka has the best graphite in the world with 97-99% carbon. There are vast reserves but only 8000 to 10000 tons are exported annually. Other than a limited production of pencils there are no graphite industries. There are also large reserves of mica, kaolin, feldspar, quartz and silica sands, all of high quality. Miocene limestone is the base of the cement industry in the island. A large reserve of apatite near Anuradhapura could be exploited for the production of rock phosphate. There are large reserves of dolomite and marble. Sri Lanka is one of the first five gem bearing countries in the world, the other being Brazil, Myanmar, South Africa and Thailand. The principal gems are rubies and sapphires while alexandrite, though not so profuse, is found only in Sri Lanka and in the Ural mountains of the former Soviet Union. Until the Dutch took possession of the entire sea board consequent to the Sinhala-Dutch Treaty of 14th February 1766, the Kandyan Sinhala Kingdom had as its major ports Puttalama in the north west and Trincomalee, Kodiyarama (both on Trincomalee Bay) and Batticaloa (Sinh. Mada Kalapuwa or "muddy lagoon") in the east. Trincomalee is one of the largest and safest natural harbours in the world. The principal modern ports are Colombo, Galle and Trincomalee. Sri Lanka’s location on the globe with a harbour such as Trincomalee gave it an unparalleled strategic importance in the past and gives it an even greater importance today. Strategically the island holds the key to the Indian sub-continent to the north and the Indian Ocean to the east, south and the west. Sinhaladipa is an attraction to subversion by external and internal forces.